What is the Passback Effect? 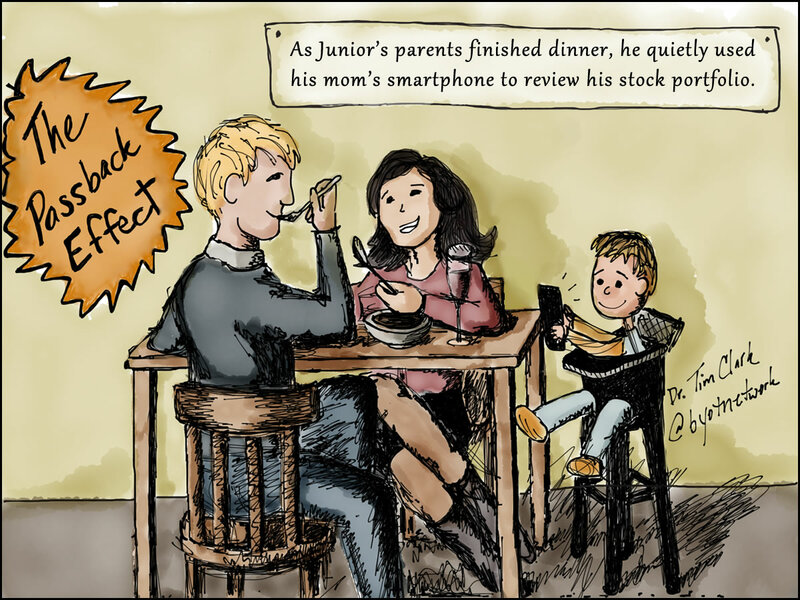 We have all witnessed the Passback Effect when sitting in a restaurant, and to keep a young child content and quiet, parents hand over their own technology device. This phenomenon also occurs when parents pass smartphones or tablets to their children in the backseat of the car or in a shopping cart. The result is usually the same as the child becomes enamored with the device, and the parents earn several precious moments of silence. What are the children doing with the device? Most likely, they are playing a familiar game, but they could also be taking photos, listening to music, surfing websites, etc. The possibilities are endless, since they are holding the doorway to all of humankind’s recorded history within their little fingers. What are the ramifications of the Passback Effect? It is difficult to tell how the use of mobile devices at early ages changes student learning. I considered making two columns for positive and negative effects, but I decided that those two categories were too limiting and judgmental. Maybe the results are just what they are since the devices won’t be going away anytime soon. Because teachers will have to realize that many young children will enter Kindergarten and pre-school with so much exposure to digital content and tools, there are many aspects of technology use that will have to be taken into consideration. I have listed five traits below, but feel free to respond to this blog post with your own suggestions and strategies. Accustomed to making choices – Since the students are choosing their content and developing their own strategies for using devices, they will want to make choices about the ways they learn. Teachers will have to focus on scaffolding learning experiences to keep the students engaged and developing new academic abilities and to provide choices that match with the students personal interests and talents. Lessons will need to be carefully planned with short meaningful chunks of information followed by interactive assignments and formative assessments in order to maintain student attention. Distracted by technology – Through the implementation of the pass back, parents have often unknowingly supported the concept that technology is a distraction device. After all, it is meant to keep the children quiet. However, when I have seen classrooms with multiple technology tools available, those learning environments are active and full of communication as students share their experiences. Teachers will have to nurture positive uses of technology and may need to help students become producers of content rather than solely consuming information. Unaware of social norms – Because children have been focused on the technology, they may not be aware of when it is time to put the devices down and look someone in the eye in order to have a conversation. Some educators mistakenly ban technology tools for this reason; however, a more effective strategy is to nurture mindfulness and teach students appropriate behaviors for face to face communication as well as appropriate online netiquette. They have modeled most of their behaviors after the adults in their lives, and unfortunately many adults have difficulty with the responsible use of technology. Ready for online learning – With all of this early access to online resources with mobile technology tools, students will be prepared for learning online. They may even enter school possessing mastery of many of the traditional standards taught to students in the primary grades. This early preparation will continue to move learning away from the one-size-fits-all model of instruction, and each student can begin progressing at his/her own personalized pace through online learning environments. These educational spaces will need to be dynamic and visual to meet the needs of early learners. 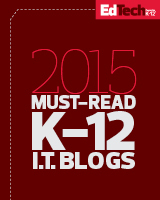 It’s an exciting time in education that will continue to transform traditional classrooms. The Passback Effect will have a lasting impact on young children as it demands change to engage their learning and forces teachers to adopt new teaching strategies.